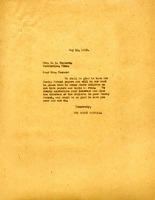 A thank you letter from The Berry Schools regarding the donation of Sunday School Papers from Mrs. S. A. Mossman. 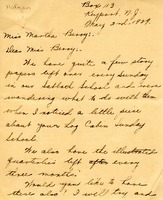 Mrs. Mosman writes in response to a request from Berry for Sunday School papers. She can send a few from each week if they would be useful. Mrs. Sylvia McMorris wonders if the Berry Schools still have a need for Sunday School papers. 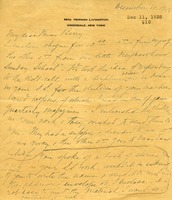 Isobel Kinney plans to send Martha Berry her old Sunday School papers. Miss Margaret Hofman asks Martha Berry if she would like to have the story papers and illustrated quarterlies from her Sabbath School. She hopes they will be of use to Miss Berry's Log Cabin Sunday School. 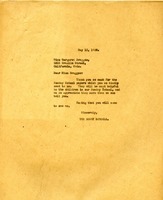 This is a letter authored by Mrs. William W. Harriman to Martha Berry. Mrs. Harriman sent Ms. Berry some Sunday school papers she thought would be useful and has offered to send more if so desired. Mrs. Harriman is from the Spruce Point Chapel, a branch of the Methodist Episcopal Church at Boothbay Harbor, ME. 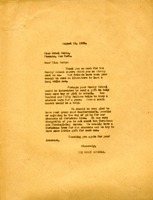 Letter written to thank Mrs. Graham for sending Sunday School papers. 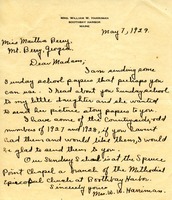 Martha Berry thanks Miss Draggoo for the Sunday School papers she sent. Draggoo, a Sunday School teacher, sends Berry papers to give to her Sunday School students. 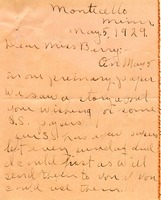 The Berry Schools thanks Miss Butts for the Sunday School papers she sent to the school. Florence Andrews is writing to tell Miss Martha Berry that her students would like to send her booklets they have made and to ask if she would like to receive any. 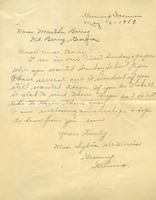 The letter is to Miss Martha Berry and includes a donation cheque (check) from the author and her neighborhood Sunday School. They took an idea of responding to the roll call with a scripture verse as described in one of the quarterly magazines. 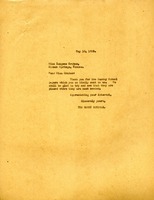 Livingston asks about a book title used in Miss Berry's Sunday School. She also congratulates Miss Berry on the recognition of her work.